Keeping carpets clean can be a constant struggle, especially for pet owners. Abby Capalbo of AbbyCapalbo.com struggled to keep her rugs clean with her golden retriever and new puppy around. Rather than removing the entire rug to be cleaned or hiring an expensive professional cleaning service, Abby was able to easily clean her favorite rug with the Hoover Spotless Portable Carpet Cleaner. Check out how easy it can be to spot clean with this small but mighty carpet and upholstery cleaner below! I’m obsessed with our dogs. There I said it. I have absolutely no shame in that whatsoever. They are such a fun addition to our household, and we couldn’t imagine a day without their crazy antics. You know what else I’m obsessed with? Keeping our house clean. And two golden retrievers (one being a pretty young puppy) and a clean house don’t always go hand in hand. Add in a snowy winter, a wet spring and muddy paws – and we often have a not-so-clean situation on our hands. For years, my solution was to have indoor/outdoor rugs throughout the house. Even those have now started to take a beating after years of abuse. I tried to cover the embarrassing spots with ottomans and poufs, but there is only so much of that a girl can do. So when I was introduced to the Hoover Spotless Pet Portable Carpet Cleaner at The Home Depot, my ears definitely perked up. Could I possibly have perfectly clean carpets again? Even with my two fluffy hooligans running around? If you have dogs, you know what I mean. We want our dogs to be part of our house because they are part of our family. They aren’t sectioned off to a certain area, because what fun would that be? I don’t want our house to be the kind of house you have to tiptoe around. I like that it’s lived in, but that doesn’t mean I want muddy paw prints all over the place or dog hair coming out of every crevice (although, trust me, that’s a constant battle). So I was anxious to see if there was a something out there that I could easily whip out in a jiffy to spot clean messes without having to remove an entire rug from a room and take it in somewhere to be cleaned. Now, I’m going to be real. I was skeptical. The stripes on this particular rugs are off white. Which means, not that easy to clean. I even mentioned to the folks at The Home Depot that I was going to be truly honest about this review – and crossed my fingers that it would work so I didn’t have to burn a bridge with a big company I’ve loved for years. Thankfully, I was really impressed with this little guy, and my love for The Home Depot continues to stand strong. I love that this particular cleaner is super portable, and VERY easy to use. There are just a few quick steps to put the Hoover Spotless together. Then you simply add the cleaning solution, and you are ready to clean with a purpose. True story, while we were shooting, Erin had to stop me from cleaning a couple of times to get a shot because this little clean machine made me want to scrub everything in my house – and that, my friends, is something to write home (or blog) about. 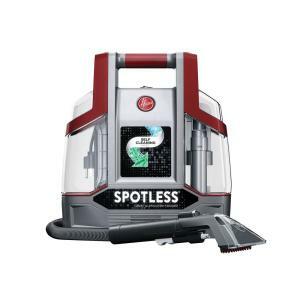 All in all, the Hoover Spotless Pet Portable Carpet Cleaner is now one of my favorite devices in my cleaning arsenal. I’m so thrilled that I don’t have to replace this rug anymore, and it can stay to live another day in our living room – even with its off-white stripes. Spot cleaning it was such a breeze – now it’s time to conquer the rest of the rugs in our house! Keeping carpets clean with pets doesn’t have to be a constant struggle with the help of Home Depot. Check out more Hoover Carpet Cleaners at the Home Depot.